Choose to import data as above. There's a fair amount to do! You don't need the grand total any more, so delete the Grand Total column. You should now have 43 rows. You'll also thank yourself for changing the data type of the final column from Any to Number at this point, so that you can sum it later. 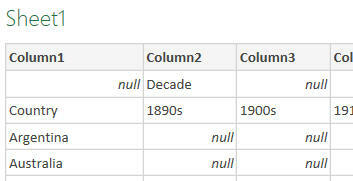 The first 3 rows of the final pivot table. Take a moment to wonder what you've achieved (! ), then save this workbook as Repivot.xlsx.